British heritage brand Belstaff continues its journey with a timeless capsule collection that references the brand’s past designs, while facing the future with bold ingenuity and a clear sense of identity. ‘Introducing’ is the first capsule collection from Creative Director Sean Lehnhardt-Moore and carries a strong sense of Belstaff’s rich history – it’s almost a century since the company first began making clothes for men and women with adventurous spirits. It also draws on the innovation that dates back to the company’s very beginnings and remains as much a part of Belstaff’s DNA as iconic innovative design. The result is an inspiring collection that offers a glimpse of the shape of things to come. The capsule contains six pieces of striking men’s outerwear, including the Journey Jacket, the embodiment of craftsmanship, dependability and style. Taking inspiration from the fabric of panniers and travel bags of the late 1950s, the Journey Jacket is cut from densely woven cotton canvas to reduce snags and tears. Further reinforcements come in the shape of hand-waxed bridle leather binding. Four spacious bellows pockets add practicality, as does the bi-swing back with a double-vent hem for ease of movement. Heavy laundering gives the jacket an easy-to-wear, broken-in feel. A generous chest pocket is flanked by a vintage Belstaff label, with a snap flap closure, and a detachable hood ensure convenience is paired with functionality, while adjustable cuff closures and an interior drawcord at the waist allow for a custom fit. The waist-length Cooper Jacket is cut from supple full-grain leather, with a nod to the Belstaff scooter jackets of the late 1950’s, it features a point collar and is lined in an archival plaid. The slim fitted Cooper Jacket is a modern take on a great Belstaff style. Aviator and tank jackets of the late 1930s were a key influence on the Trail Jacket. Built for life to protect against the cold and wet, this waxed jacket is made from our institutional water repellent 6oz cotton, which is strong enough to deal with both the elements and heavy wear. The detachable merino wool shearling collar and onion-quilted lining add insulating warmth and flair, while the action back detail allows for a full range of motion. Inspired by the design of a Belstaff shooting vest, the Hunter Vest boasts versatility and easy styling. Worn as either an outer- or mid-layer, it is diamond quilted in a water-repellent cloth and is insulated with a lightweight fill. A stand up, wind-cheating collar lined in corduroy or shearling adds style and comfort to protect from the elements. The double-breasted, three-quarter length Garrison Coat is inspired by Belstaff’s 1930s military storm coats. Considered design has resulted in a coat for all seasons – light enough to layer, yet warm enough for winter. Made from sturdy cotton and linen reverse twill with a fully seam-sealed and taped interior, this attention to detail is maintained throughout, with engine-turned horn buttons, an adjustable belt, and a deep-vented back allowing ease of movement. With the concept of outfitting driving Lehnhardt-Moore’s design philosophy, a range of knitwear, scarves, jersey and shirting provide ideal layering options within the capsule. The perfectly considered knitwear ranges from lightweight wool cashmere blends for men and women, to textured winter waffle, fisherman rib and cable knits. Cotton shirts, crew neck jerseys and generously sized knitted scarves complete the capsule. The ‘Introducing’ capsule will be available exclusively from Belstaff stores worldwide and online at www.belstaff.co.uk/men/collections/introducing/ from mid October 2018. Outerwear prices start from £375 / €395 / $475 with knitwear from £140 / €150 / $180. Belstaff waxed cotton jackets are priced from £295 / €325 / $395. 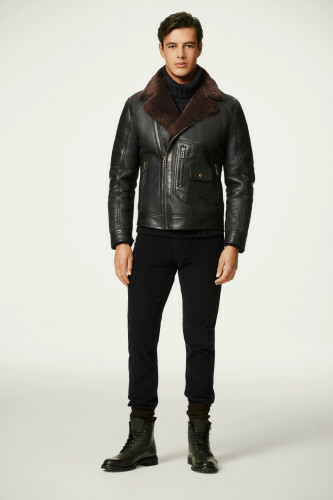 For close to a century Belstaff has been making clothes for men and women who want more from life, to push the limits. Technically excellent, beautifully crafted British design and know-how is at the heart of what we do, and our clothes are beyond fashion but always in style, innately cool and appealing to men and women who are used to going the extra mile and living life on their own terms. Our iconic jackets had the back of everyone from aviator Amy Johnson to adventurer TE Lawrence and revolutionary Che Guevara. We still make those jackets today - and we still kit out some of the world's most questing individuals - but we make much more besides. Rigorously designed, effortlessly good-looking and built for life: Belstaff is for people who don't think getting dressed is the most important thing they’ll do that day.